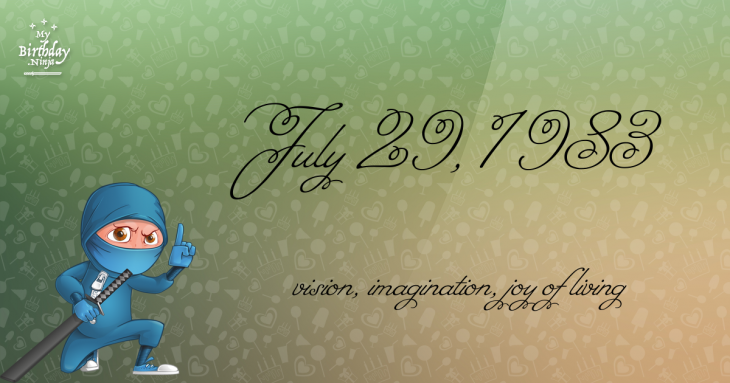 Here are some snazzy birthday facts about 29th of July 1983 that no one tells you about. Don’t wait a minute longer and jump in using the content links below. Average read time of 10 minutes. Enjoy! What day was my birthday Jul 29, 1983? July 29, 1983 was a Friday and it was the 210th day of the year 1983. It was the 30th Friday of that year. The next time you can reuse your old 1983 calendar will be in 2022. Both calendars will be exactly the same! This is assuming you are not interested in the dates for Easter and other irregular holidays that are based on a lunisolar calendar. There are 101 days left before your next birthday. You will be 36 years old when that day comes. There have been 13,048 days from the day you were born up to today. If you’ve been sleeping 8 hours daily since birth, then you have slept a total of 4,349 days or 11.91 years. You spent 33% of your life sleeping. Since night and day always follow each other, there were precisely 441 full moons after you were born up to this day. How many of them did you see? The next full moon that you can see will be on April 19 at 11:14:00 GMT – Friday. Fun stat: Your first one billion seconds (1,000,000,000) happened sometime on April 6, 2015. If a dog named Deja - a Goldador breed, was born on the same date as you then it will be 203 dog years old today. A dog’s first human year is equal to 15 dog years. Dogs age differently depending on breed and size. When you reach the age of 6 Deja will be 45 dog years old. From that point forward a large-sized dog like Deja will age 5-6 dog years for every human year. Pakal ascends the throne of Palenque at the age of 12. Count Dirk III defeats an army sent by Emperor Henry II in the Battle of Vlaardingen. James VI is crowned King of Scotland at Stirling. Irish Potato Famine: Tipperary Revolt: In Tipperary, Ireland, then in the United Kingdom, an unsuccessful nationalist revolt against British rule is put down by police. American Civil War: Confederate spy Belle Boyd is arrested by Union troops and detained at the Old Capitol Prison in Washington, D.C. The First Hague Convention is signed. Construction of the Link River Dam begins as part of the Klamath Reclamation Project. An overloaded passenger ferry capsizes on the Kasai River in Bandundu Province, Democratic Republic of the Congo, resulting in at least 80 deaths. What does my birthday July 29, 1983 mean? Your birthday numbers 7, 29, and 1983 reveal that your Life Path number is 3. It represents vision, imagination and joy of living. You possess a great talent for creativity and self expression. The following celebrities also have the same life path number: Grandmaster Caz, Vittoria Puccini, A. K. Hangal, William Conrad, Ken Gampu, Christopher Egan, Melanie Griffith, Drake Bell, Robert Forster, Han Ji-hye. What is the birthday horoscope for Jul 29, 1983? The Western zodiac or sun sign of a person born on July 29 is Leo ♌ (The Lion) – a fixed sign with Fire as Western element. The ruling planet is Sun – the center of our universe. According to the ancient art of Chinese astrology (or Eastern zodiac), Pig is the mythical animal and Water is the Eastern element of a person born on July 29, 1983. Fun fact: The birth flower for 29th July 1983 is Larkspur for haughtiness. What is the Love Match for Jul 29, 1983? When it comes to love and relationship, you are most compatible with a person born on March 24, 1981. You have a Love Match compatibility score of +129. Imagine being in love with your soul mate. On the negative side, you are most incompatible with a person born on January 13, 1994. Your incompatibility score is -167. You’ll be like a cat and a dog on a love-hate relationship. Arf-arf, I want to bite you. Meow-meow, stay away from me! The number-one hit song in the U.S. at the day of your birth was Every Breath You Take by The Police as compiled by Billboard Hot 100 (July 30, 1983). Ask your parents if they know this popular song. I do not know how you feel about this, but you were a male ♂ in your last earthly incarnation. You were born somewhere around the territory of Southern India approximately on 1075. Your profession was digger, undertaker. How many babies were born on July 29, 1983? Base on the data published by the United Nations Population Division, an estimated 131,547,856 babies were born throughout the world in the year 1983. The estimated number of babies born on 29th July 1983 is 360,405. That’s equivalent to 250 babies every minute. Try to imagine if all of them are crying at the same time. What is the popular baby name on 29 Jul 1983? Here’s a quick list of all the fun birthday facts about July 29, 1983. Celebrities, famous birthdays, historical events, and past life were excluded. 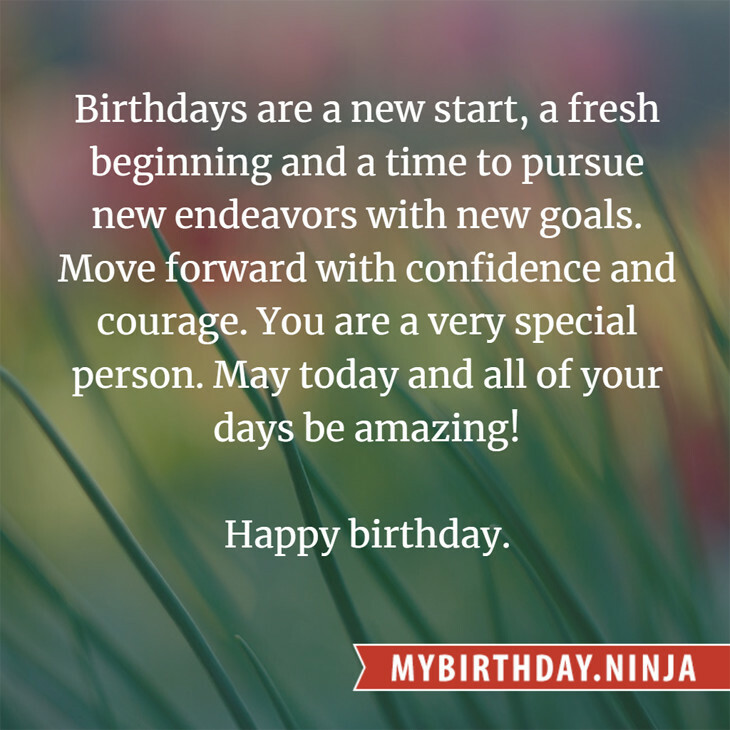 Try another birth date of someone you know or try the birthday of these celebrities: April 9, 1933 – Jean-Paul Belmondo, French actor and producer; January 17, 1975 – Squarepusher, English singer-songwriter; April 5, 1988 – Asumi Nakada, Japanese voice actress and model.